Winkleigh: Local Industry & Agriculture. Pubs, Ghosts, Cider making and her Buildings. 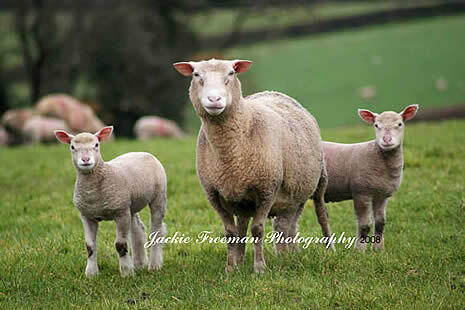 It was farming and in particular the wool and sheep trade, not cattle and dairy produce that put Winkleigh firmly on the map in the middle ages and made its landowners richer. So from medieval times onwards, the cloth and wool trades flourished in this part of Devon. Serge manufacture and weaving in particular was an extremely important part of Winkleigh's development. A Royal charter issued by Henry III in 1262 granted Winkleigh a weekly market and three annual fairs. The regular weekly market then being held in the village on a Friday throughout medieval times and major agricultural fairs were held annually. 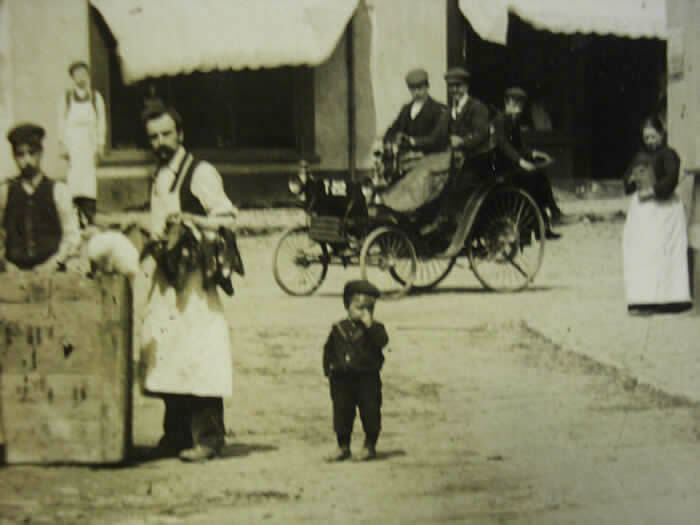 Such were the fairs' importance, that merchants would travel from miles around to the Winkleigh market to trade in salt and wine for the cloth, serge and wool that Winkleigh traders would barter. Their produce would then be despatched by pack horse and cart for the full days trek to the ports of Bideford in the north and Exeter and to destinations all over Britain and Continental Europe the following week. Time passed and the farmers of Devon began to diversify their crops too and apart from the staple cereal crops of wheat and corn, barley, potato, cabbage & other vegetables began to appear. Then with the invention of the seed drill in the 1700's, agriculture was turned on its head and the approach of the industrial revolution saw huge changes here. A local rail head was built only a few miles away from Winkleigh at Eggesford and suddenly sheep and wool, now in huge demand from the northern woollen mills, alongside cattle, milk and dairy produce, could be transported and distributed quickly and effectively beyond Devon and all over England. Tradition is seldom buried nor is it forgotten in Devon and farming in those days was a social occasion, with many a hand turning out to cut with sickle and locally, even today, crops as you can see in the image above, would have been stooked by hand in the traditional manner and threshed with a ‘Draishel’. This all may be hugely time consuming but it had its sense of purpose. Plant and reap by hand and you are at one with the land and the Lord..
One to rot and one to grow”. Local craftsmanship does still exist if you look for it here. Hedge laying, walling and thatching is still completed by hand. Sadly, no longer is there a market in Winkleigh, though I am sure the charter would still allow it. So its neighbouring village of Hatherleigh now reaps the commercial spoils with a bustling weekly market with a fine display of local produce, fish, meat, cheeses and locally made preserves which brings in Devonians and Grockles alike, rain or shine. With a total land acreage in excess of 9118 acres, farming, now as in the past, is still the main occupation in the Winkleigh area. Although the Parish was and is also renown for producing its liquids, cider in particular and in the time of the Romans - WINE ! amuel Inch began his cider making company in Winkleigh towards the end of World War I, though scrumpy, which is a strong windfall cider, has been a traditional brew in the area for aeons. So much so, that in Winkleigh & Devon during the middle ages, it became a tradition to pay part of a farm labourer's wages in cider. So it goes back a long way and as every farm made its own scrumpy & cider, apple orchards were a major feature of the Devonshire countryside. Romantic names such as the Foxwhelp, Bloody Butcher, Handsome Maid, Sweet Alford, Kingston Black, Dabinett, Tom Putts, Ashford brown and the indomitable 'Slack-my-Girdle' varieties of cider apple appeared in cider orchards throughout the county & the Winkleigh area developed a reputation for producung some of the best cider in the land. Samuel Inch's Cider Company carried on for many years in Winkleigh, with a great national following for its traditional Devon cider but just couldn't keep up with the more modern factory production levels of other commercial cider makers like Coates, Gaynors & Bullmers. Swift to pounce on the company at the demise of Samuel Inch, Bullmers who had for years had been winning at cider monopoly in the UK, bought out Sam Inch's cider making business in Winkleigh in the early 90's and promptly closed the production plant in Winkleigh down. Making sure that when they did so, all the cider making equipment was removed, sold on or destroyed before they left. 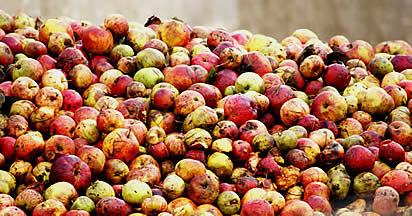 Scrumpy cider apples, 'Windfalls' at the Winkleigh Cider plant waiting to be crushed. Reprieve: Local cider maker and entrepreneur David Bridgeman who learned the trade of cider making as an apprentice at the side of the great Samuel Inch and was his chief cider maker at his Hatherleigh Road plant, decided to go it alone and developed a new cider pressing plant in Winkleigh on Inch's original site. Making cider as he knew best. In the 'traditional way. Historically, the pulping of cider into 'pomace', its pulp form, was effected by horse power. The farm horse dragging a stone wheel around a stone mortar. But in the true spirit of Devonians, all manner of domestic implements have been imaginatively put to good use at cider pressing time, including garden shredders & even wash day mangles! The natural yeasts which are inherent in cider apples act quickly on the extracted apple juice and unlike the brewing of beer and ale, additional yeast is unnecessary for nature to do its trick. In about six weeks or so, the cider is ready for bottling and for some, drinking. But it usually takes six months or so till its ready and for good quality Scrumpy, like the oak casked Scrumpy made today at the Winkleigh Cider Company, up to 3 years to mature! 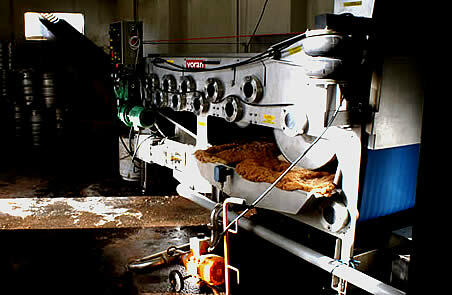 Photograph: The Winkleigh Cider Company: Cider pressing & bottling room. 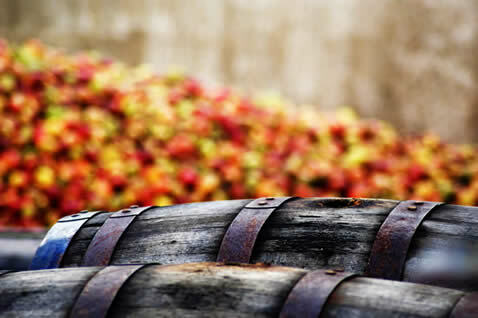 Though operating a state of the art cider making plant, the Winkleigh Cider Company still produce traditionally made and oak casked cider and scrumpy of the highest quality from local Devon cider apples. And my goodness, is it good! Hector John which Samuel Inch paid 30 /- (Shillings) for. For the travelling wayfarer of the middle ages, it was tough going. Roads in the main were rutted and worn and stricken by the ravages of the weather, which down here means rain. So it was hard work to get from A to B and much travel, contrary to popular belief, was done by Shanks's Pony. That's on foot and not by horse and cart or stage coach. So traditionally back then, you traveled light as you literally had to carry all you needed. extension to this would in time, naturally be the country Inn. Here's a place providing for all of the needs of the traveler, refreshment, lodging and even entertainment and it was all part of this natural progression. With the development of modern stage coaches, provision also had to be made for the stabling of horses and the repair and maintenance of the turnpikes' vehicles too. That's how the English Coaching Inn was born. With that though came rules and regulations for the Inn keeper and his hostelry. Rules and regulations which still remain and in many cases are enforceable today. For a start, back then, travelers were pretty well at the mercy of the Innkeeper. They had little choice, or sleep under a hedge. So they bought what food that they needed or was available from the proprietor and could be charged really what he wanted for his ale and lodging. A complaint that is much the same today, particularly at motorway service stations! So travelers, getting bit sick of this, petitioned Parliament and the King, Edward III back in 1350, initiated a statute to control Innkeepers which was passed. This enforced a reasonable charge for food and lodging and stopped the; " great and outrageous cost of victuals kept up in all the realm by Innkeepers." Inns now had to provide food, shelter and protection to their wayfaring guests and standards at last improved. It also became law as part of that statute that if a traveller reached an inn whilst closed and he was not drunk or disorderly, he may wake the innkeeper and demand admittance and the innkeeper had to comply!! I'll try that next time I pop down to the Kings Arms and they're closed! 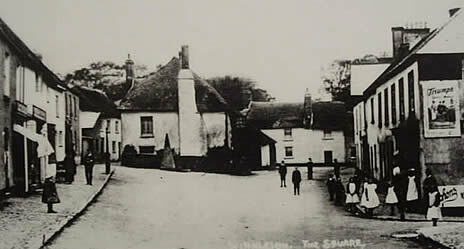 Winkleigh Square, Devon in 1911. 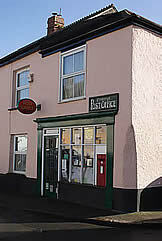 Little has changed in the last century in the centre of Winkleigh, with the exception of the influx of modern motor vehicles into a village built for pack horse and mule and the loss of its many original shops and some of Winkleigh's most endearing, timeless features, its traditional pubs. The Kings Arms or as it was once known the Kings Arms Inn as listed in Whites 1850 Directory and the Seven Stars Pub still thrive today. In 1843, the Barnstaple Inn was destroyed by fire, the Clotworthy Arms, a coaching inn and Royal Mail changeover post for the Exeter Bideford Mail up to 1840, later closed too. The Butchers Arms was destroyed in a blaze in 1896 but was rebuilt and renamed the Winkleigh Hotel which survived until the 1960's and the oldest of them all, the Ring o' Bells was engulfed and totally destroyed by fire in 1968. 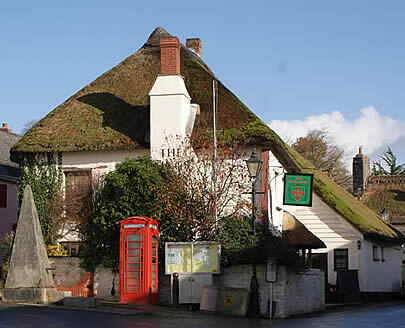 Thatch was the principal problem, though there are rumours of arson! The Kings Arms public house in Winkleigh, seen above in the centre of this early black and white photograph on a 1911 postcard, is still both a prominent landmark and well loved watering hole for locals and visitors to Winkleigh alike. Originally three buildings, it's now one. The Kings Arms being of a typical in local design. Thick local stone and cob walls under a traditional Devon Thatched roof. Atypical too of a sixteenth century building, in that the Kings Arms has not one, but two friendly ghosts! The Kings Arms in Winkleigh, takes its name from the time when the original Winkleigh Inn keeper wanted to demonstrate his loyalty to the crown and goes back centuries as an Inn and it owes its existence entirely to the turnpike, the traditional route to Exeter in the east and Plymouth to the south as the ancient roadway route lies directly below the village. In the days of old, it would take the best part of a day to reach the city of Exeter from Winkleigh and up to four to London, so bad and rutted were the narrow lanes. Traditional coach houses such as the Kings Arms therefore, played an important role in the 'heads on beds' and hostelry business. Though its true to say most of its original travelling patrons would have arrived on horseback or in a cart rather than traditional English stage coach and horses. 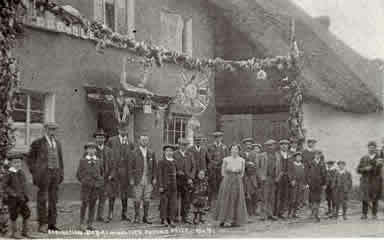 The Kings Arms, as a way station that provided accommodation, food, scrumpy and ale, alongside stabling, fresh horses and a local smithy to boot, apart from local village tradesmen, shoe repair, stitchery & a place of worship, then the Kings Arms would have been the focal point of the community as it still is today. 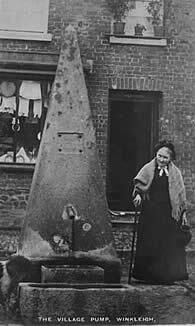 Though there is now a traditional British Red telephone box and a copy of the early Edwardian gas lamp which once stood outside the pub, the stone built pyramid of the village well is still a prominent feature of the village square & little has changed in the last 100 years when you compare the photographs of it back then and now. Mystery has shrouded what was believed to be a spring fed well which is now a glass capped feature of one of the Kings Arms, Winkleigh' dining rooms, but it is actually sited where what originally was a courtyard of the Inn in George I time. 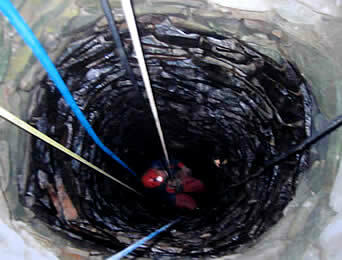 In 2002, a team from the Winkleigh Cave & Mine Exploration Group (WCMEG) successfully drained the 30 foot deep stone lined shaft & undertook a full survey. At the bottom of the shaft were two five foot high tunnels, one leading in the direction of the church, the other to the north west. 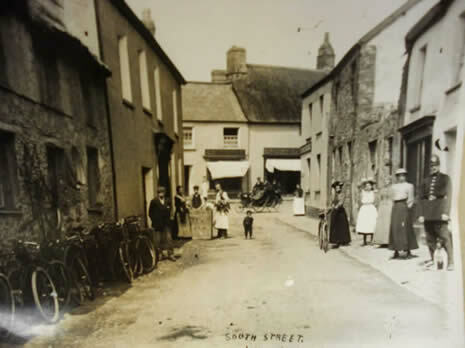 It is a reasonable hypothesis that in the days when silver and even gold had been found as close as Brushford and North Molton in Devon, some enterprising Winkleigh residents, anxious not to draw the attention of the Kings Taxman to themselves, had begun a secret enterprise. To find and secretly mine silver, literally in their own back yard. The pub courtyard! Like all traditional Devonshire villages, Winkleigh wouldn't be Winkleigh without its share of ghosts and apparitions and apparently no less than two friendly phantoms reside at the Kings Arms in Winkleigh. 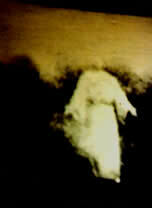 It's not as you would expect either: Perhaps a Saxon warrior or the poltergeist of an ancient Norman serf? Maybe a Roundhead Yeoman or two or a spooky headless wandering Cavalier? Afraid not. Cecilia, as she is affectionately known by the pub landlords, is a little girl who it's said, likes to hang on to the aprons of the waitresses in the Kings Arms restaurant and is something of a mischievous little madam who likes to knock over pots and pans when ever she can to get some attention. George on the other hand, is a pretty nice old gentleman as far as spectres go and he may well have lived in the village back in time. He seems to sort out most problems for the pubs owners and can always be asked for advice. The one thing he doesn't like however is change & makes it quite clear if he's upset about changes in the pub that he probably used to frequent in another life. So he'll drop the odd bit of crockery or a bottle or two, but in slow motion though just to liven things up for the staff. 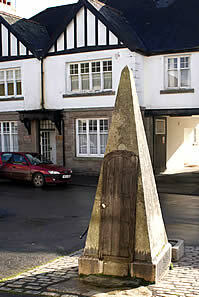 This functional and efficient granite water pump in the shape of an obelisk, stands where it has been since 1833, at the eastern end of the village square adjacent to the Kings Arms pub & has provided fresh spring drinking water to Winkleigh villagers until mains water finally came to the village. It was erected as a commemoration to the Great Reform Bill which paved the way for the democratic system of vote for all and clearly was a major stepping stone in the reformation of British parliament. <The photograph on the left appeared on a postcard dated 1908 but we know that it is an image that was taken much earlier. The lady in the traditional Victorian black dress with her walking cane is Temperance Hunt, a villager who passed away in 1902 and lived to the wonderful age of 99 years. Anecdote: Sammy Lendon was once written to by the Parish Council and told to stop washing sheep's innards at the pump ! "When is a pub not a pub? When it isn't a pub no more!" 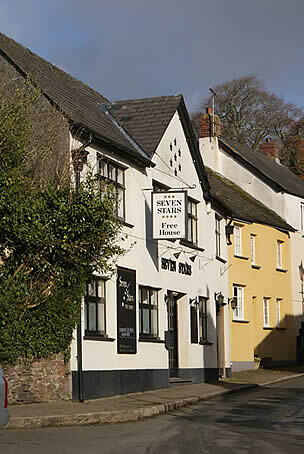 The Seven Stars in Winkleigh has had a chequered life to say the least and whilst it is believed to go back into the 1700's, its first recorded use as an alehouse was back in 1822, when the landlord, one Richard Inch of that great Cider making family was in charge. By the late 1870's it had reverted to being a house, later to a shop and again, back in the beginning of the 1900's, to a pub again. As is prevalent in Winkleigh, the top floor was gutted by fire in the fifties and the place rebuilt, now enjoying top ranking CAMRA ratings for fine traditionally brewed ale and a focus for charity events, good natured village rivalry and fun. and the pub was rebuilt, remodeled and modernised. 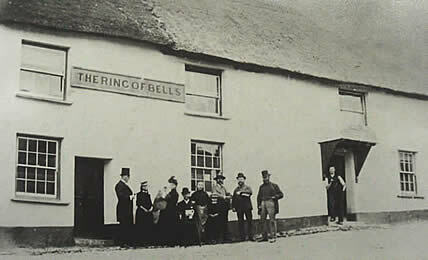 The Ring O'Bells Pub was one of the oldest if not the oldest existing building in Winkleigh. 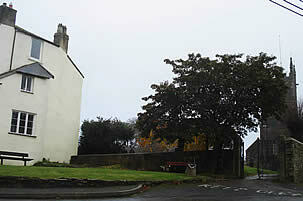 primarily built to house the workers who built the church so it stood right outside the church gates. 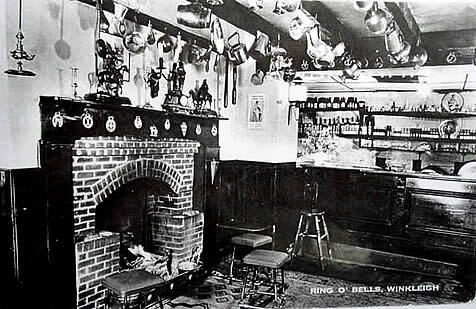 A newsworthy claim to fame is that the Ring o'Bells Pub was offered as a first prize in a competition run by the Daily Sketch newspaper. It was a monument to history which will be sorely missed. Below: South Street Winkleigh at the turn of the century. The eagle eyed amongst you will spot the village Bobby on the right of this vintage photograph, which we've enlarged below. On the left is Charlie Bissels bicycle shop, one of two bike shops in the village and a piece of entrepreneurial genius in the days before motor cars were popular and affordable. Cycling was 'the' way around Winkleigh & district and suppliers & repairers like Saunders and Bissel both in Winkleigh were at the forefront of 'modern' business development in the area. <Now look closer at the centre of the photograph in the background and you will see something even more amazing. It's what we believed to be Winkleighs first car, which we think is a Karl Benz's Velo of 1898. But we were wrong!!!! Many thanks to the national Motor Museum at Beaulieu for solving this puzzle for us after much research.. This in fact is a very rare motor indeed! It's a Peugeot Type 5 - 2 seat Quadricycle made between 1894 and 1896 powered by a Daimler 2 cylinder engine with a chain drive transmission and about as rare as can be. Some sources indicating that there were as little as 14 ever made! Another part of the puzzle solved is that the vehicle has a registration number which puts the photograph at a date after 1903 as it wasn't until then that road vehicles had to be licenced. All things considered, it probably belonged to Mr Saunders senior and that would make sense with it being in a photograph taken by his son. Posing for the photograph with ladies of the village is the village 'Bobby' and his Ratter. Clearly this is of the most amazing features of this vintage Winkleigh photograph circa 1899. Blown up here on the right, you can see the motorised vehicle, two small wheels at the front, two larger at the rear, holding three people. It was photographed just outside where the Vets is today in Market Square but was back then, a shop. The cap hatted gentleman driver in the car is photographed with his more elderly rug covered passenger. In the pull down seat at the rear is another passenger a young man facing backwards & clearly they are monied. Winkleigh resident Edward Saunders, was a pioneer of motoring in Devon. The local garage owner & way ahead of his time. He was also an official government photographer and responsible for making a photographic record of Winkleigh ways which were immortalized as postcards. 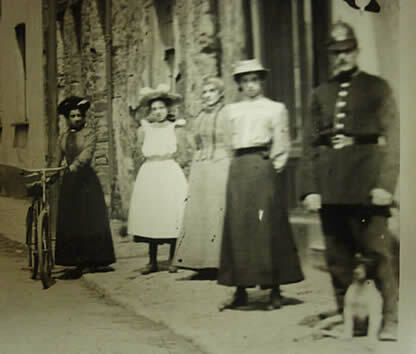 He was also a bicycle manufacturer and retailer he was one of the first motor traders in the county of Devon. <Saunders Cycle and Bicycle repair Shop in Winkleigh after the turn of the century in about 1904. Two vehicles one a sporty saloon registered for the road T212, the other bearing two ladies who it is believed are young members of the Saunders family. Interestingly this is believed to be an early electric powered vehicle as it does not match any vehicle known by the National motor museum. It is more than likely one of Mr Saunders own inventions! Why not? He built made to measure bicycles after all. The Saunders were entrepreneurs extraordinaire and had retail businesses in Winkleigh which literally supplied anything you may have needed. There was Saunders shop in the square run by Eliza Saunders, mother to 11 children, which provided hardware to homemade sweets. Edward Saunders' background as a gunsmith and jeweller led him to open a bicycle manufacturing workshop making bespoke cycles, 'made to measure.' He owned the first garages and petrol station & even the first omnibus! Quite a man. Colliholes grocery shop, Winkleigh's very first Tesco's which you can just see in the background of this photograph above, was easily the 'poshest' shop in town back then . It had a big purpose made mahogany counter with little drawers and glass fronted cabinets from which you were served by a man with a fresh white apron. 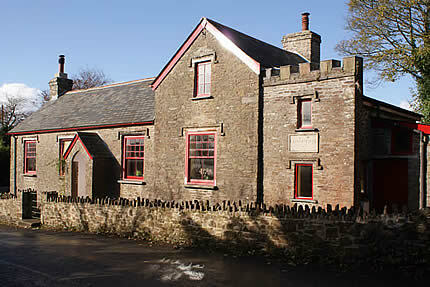 <Castle School, Winkleigh is built on part of the site of the ancient home of the Tracey family, Croft Castle. 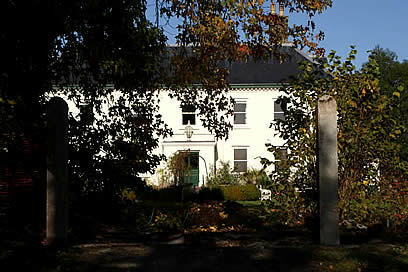 Kelly (1893) tells us that Winkleigh had its own school which opened in 1876 and catered for around 180 pupils. It's average attendance though was only about 100 children. The school-master and school-mistress at the time were James TIPPER the master and Mrs Sarah Ann TIPPER, who was the school - mistress for the infants. We have transcribed the full entry for WINKLEIGH for those of you who would find this feature useful and it can be accessed by clicking the photo on the left or the word WINKLEIGH here. It lists alphabetically the names, addresses, occupations and trades of all individuals in residence in Winkleigh in 1902. 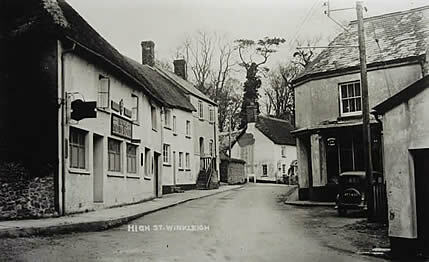 At one time the village of Winkleigh sported over 50 shops and everybody knew everybody. Post war, the time capsule that was Winkleigh, all but self sufficient at one time, burst and began to fade with the slump. As did its local retail industry. Sadly, village life would never be quite the same. Mrs Birds Shop: Where you could buy anything and everything. The Corner shop: An Emporium that sold everything from babies bottles to nails. Farley's Shop: On Coopers Hill. The Taylor: Mr Turner. Taylor turner made suits and repaired breeches. Newspaper Shop : Mr Newcombe and his sister. Cycle Shop: Charlie Bissel's in South Street. George Mitchel's: Carpenter and Undertaker. 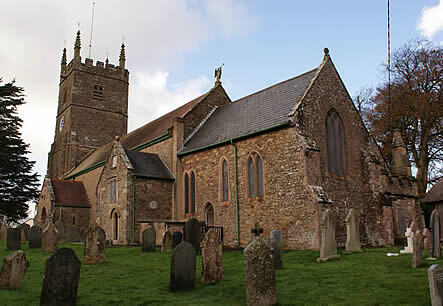 All Saints Church Winkleigh Devon. Pubs, Public Houses and Inns: The Kings Arms Pub Winkleigh.